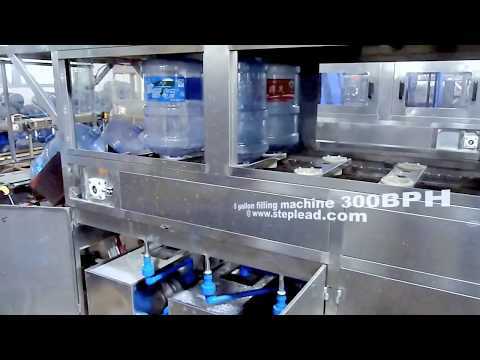 The 300BPH bottle Filler is the core equipment for the 3 gallon, 5 gallon bottled drinking water production line. It is an ideal equipment for the production of mineral water, distilled water and pure water. The equipment draws on the advanced technical performance and advantages of domestic and foreign filling equipment, and has the characteristics of full function, low energy consumption, small scale, low investment and high automation. The machine is made of high-quality stainless steel square tube frame and stainless steel wire drawing board. It is compact in structure, elegant in appearance and novel in design. It integrates automatic liquid disinfection & circulation water washing, pure water washing, insert type filling, cap sorting, cap hanging and cap pressing. The operation is simple and convenient, and the performance is stable and reliable. It is an ideal filling production equipment for drinking water manufacturers. In order to relieve heavy manual labor, the filling production line can be fully automatic control production, integrating automatic online de-capping, barrel washing, disinfecting & rinsing, circulating water washing, pure water washing, automatic filling, cap sorting and sealing, cap label shrinking, batch code printing, bottle bagging, palletizing, PROSTACK rack loading, fully automatic integrated and closed management, truly non-bacterial production. The machine is a flushing, filling and capping machine. It adopts the cylinder capping. The valve has CAP reflow function. The caps storage chamber designed with an hourly output. The flushing pressure is displayed. The 316 pipe fittings must be used for the finished water. The internal pressure is not less than 0.28 MPA, the time is not less than 16 seconds, and the external pressure is about 0.2 MPA. The lye and the disinfectant respectively have heating systems. The main electrical components are SIEMENS and OMRON products, and the original pneumatic components are imported AIRTAC products. Both the inner and outer nozzles for washing the bottles are made of imported American spray company's unique technical equipment. The line equipment is compact in structure, high in work efficiency, stable and reliable, sensitive in action and high in automation. It is a fully automatic bottling machine integrated with mechanical, electrical and pneumatic systems.